The cylinder sleeves for our Cool Jugs cylinder assemblies are manufactured from through hardened 4140 steel starting from a raw forging. 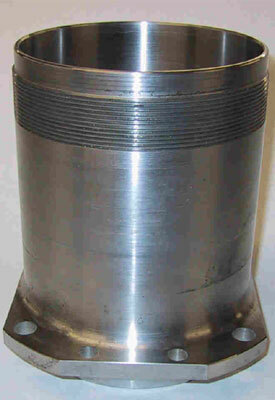 Each sleeve is precision machined using the latest CNC lathe equipment. The cylinder bore is then left untreated and simply honed for those customers that want a plain steel finish or for a more long lasting finish we offer a proprietary, corrosion resistant nickel-carbide plating process that provides excellent wear characteristics. Finished sleeves are then mated with the cylinder head/coolant jackets by screwing the two components together. An interference fit between the cylinder head/coolant jacket and the cylinder sleeve assures a positive seal, excellent thermal conductivity and a solid assembly.